The next Forget Me Not tea party is on Thursday 14th February 2.00pm – 4.00pm. Come and enjoy afternoon tea and home-made cakes, meet old friends and make new ones, have a good natter about anything and everything. Absolutely no charge. A warm welcome to all. Starting on Monday 11th February at the Parish Church. Come and join our friendly and informal group to practice or improve your Welsh. Contact the elderly is a national organisation which changes the lives of people aged 75 or over, who live alone and have difficulty getting out on their own. Sunday afternoons are felt to be the loneliest time of the week, when weekday services are not routinely available, so Sunday afternoon tea parties provide the opportunity for fun and friendship. In St Asaph, members of the Rotary Club and St Asaph WI, supported by Contact the Elderly have joined forces to start a Sunday afternoon Tea Party in the Parish Church once a month, between 3.00 – 5.00pm. January 13th saw 4 invited guests entertained royally with food and conversation, before being chauffeured back home! Guests’ attendance must be pre-booked so that arrangements for transport to and from home by a volunteer from the Rotary club can be assured and any allergies catered for. Please nominate them or yourself as a guest by completing and posting the information requested below, or contact Dr Marion Hughes on 01745 590960 for further details or to discuss individual requirements. 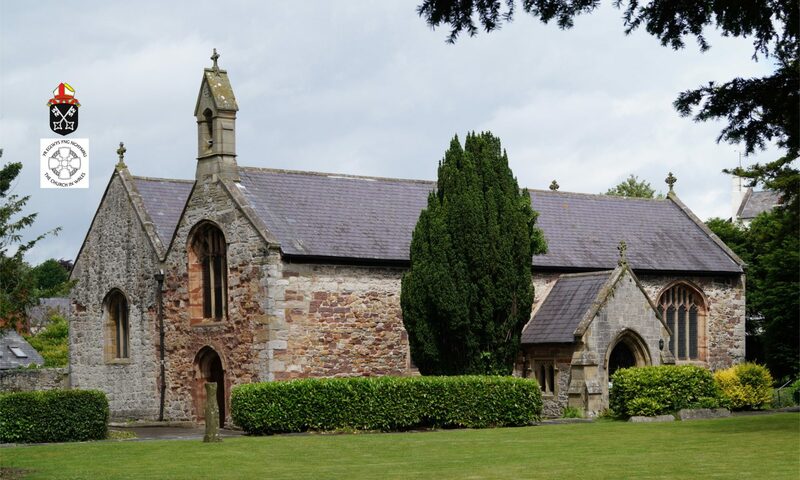 On Thursday 10th January 2019 the Dementia Support Officer for the St Asaph Diocese, the Revd. Dr Bob Frederick, presented to the church a Certificate in recognition of it working to become a Dementia Friendly Church. The Certificate was received by Mrs Marion Hughes on behalf of the church. This recognises the church’s commitment to continue to provide monthly Forget-me-not Teas; continue to provide and improve school visits to local residential homes; continue the annual Memory Walk; and of course develop further a strategic approach to improving resources, and to link up with similar initiatives addressing the needs of those living with dementia. The assistance and guidance provided by the Revd. Bob Fredrick is greatly appreciated. To commemorate the centenary of the First World War, the children of St Asaph VP Infants school, Ysgol Esgob Morgan and Fairholme Schools have made poppies out of used plastic bottles to help create an art display inside St Asaph Cathedral. If you too would like to make a poppy, especially in memory of someone special to you, come along to the cathedral on Tuesday 30th October between 10am and 5pm. Please bring a clean 1 or 2 litre clear plastic bottle (with lid and lemonade or cola shaped) with you – tuition, glue and glitter will be provided. Your thoughts on a Community Hub in the Parish Church? We are currently trying to find out your views and thoughts on establishing a community hub in the St Asaph Parish Church. Even if you have already filled in a paper questionnaire or been part of the consultation, we would still appreciate your views in this survey. Many thanks in advance. On Saturday 15th September a small but dedicated group of walkers completed a Memory Walk to raise funds for the Alzheimer’s Society. The route started and finished at the parish church, and took in the very pleasant footpaths along each side of the Afon Elwy. A surprise reward for finishing, apart from the satisfaction of raising much needed funds for the Society, was the fine selection of home-made cakes, tea and coffee kindly donated by the ‘walking’ ladies. A sum of £92.50, and counting, has so far been raised. If you wish, you can still contribute, by logging onto www.JustGiving.com and search for Marion Hughes St Asaph Memory Walk page. In this way, your donation goes straight to the Alzheimer’s society, and you can add to it by ticking the gift aid box, where appropriate. Hopefully we will have e few more helpers next year. Every pound raised goes towards the funding of new research, providing precious support to more people, wherever they are, and whatever they are going through. A gentle reminder that the Flower Arranging Classes start next Friday 21st September, 10.00am to 12.00pm. Further details are below in previous posts, or just input Flower Arranging in the ‘Search’ box. A few places remain. Don’t be disappointed, book your place now by contacting Marion on 07841 160430, or e-mail at marionkh@btinternet.com. The Messy Church Holiday Club has continued throughout the school’s summer holidays, held every Wednesday from 10.30am to 12.30pm. A great variety of activities have and are being enjoyed by very many children, and their parents and grandparents. Activities include numerous craft making sessions, where the children of all ages create crafts that they proudly take home or are left to be displayed in church; there has been interesting and creative painting by the younger ones, and there are singing and story times. A magician came to entertain children and adults alike. A picnic is provided for each child, which can be enjoyed in the church or on the grass of the churchyard if the weather is fine, where the children can play in safety. Wednesday 29th August will be the last Holiday Club of this summer season. Hope we’ll see you there for another fun day. Some images of the creative fun and song on Wednesday 23rd August. Fun, friendly affordable training. Learn how to make beautiful flower arrangements. This is a great opportunity to learn from scratch or extend your skills. Tuition will be by an experienced NAFAS demonstrator, judge and speaker. A course of 6 weekly classes in St Asaph Parish Church. Starts on Friday 21st September, and then each Friday for 6 weeks, 10.00am to 12.00pm. Refreshments will be provided. A basic triangle. A posy design. A continental design. A wreath ring design. A pedestal arrangement.